Vanilla Donuts with Blueberry Lemon Glaze are a guilt free (and vegan!) way to enjoy this breakfast treat. While I am wrapped up with feeding an infant, changing diapers, feeding an always ravenous preschooler, putting in a Toy Story DVD, chasing the aforementioned preschooler while holding the aforementioned infant, and all the other insanity that comes along with a new baby, my foodie friends are taking turns in the Cupcakes & Kale Chips kitchen. Make sure you head on over to Pinterest, too, where I will be pinning all of these awesome recipes on my Guest Posts board, plus my Inspiration boards! Today I’d like to introduce Lisa from Je suis alimentageuse, who is bringing donuts! 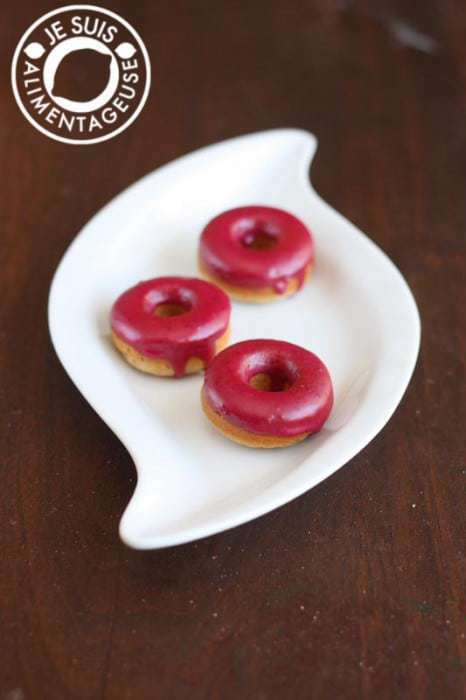 And not just any donuts – light, guilt free Vanilla Donuts with Blueberry Lemon Glaze (with vegan and gluten free options)! I should have required Lisa to send me a dozen along with her post and photos! You can find Lisa on Google+, Twitter, Facebook, Pinterest, or subscribe via RSS or email. Hello, Lisa here! Brianne has graciously let me share this recipe with you lovely readers and I’m so excited! So at Je suis alimentageuse, I try to keep things kind of healthy, although every now and then, I like to splurge and indulge in something sweet. And by every now and then, I mean that it happens pretty often. But these little donuts are almost guilt-free. They’re vegan, first of all, and I substituted agave nectar in the donuts to reduce the amount of sugar in these donuts. 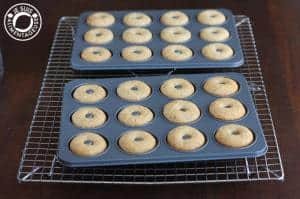 This recipe is really easy to modify for different flavours. You can add some cocoa powder or melted chocolate or different extracts for flavour. You can even change the glaze. I’ve made lemon donuts by adding zest to the batter, and then using the juice with icing sugar to make a glaze. To make these gluten-free, just use a gluten-free AP flour blend (I use 2 parts rice flour + 1 part potato starch and 1 part tapioca starch) and add xanthum gum. Mix flax seed and warm water in a small bowl. Stir then let sit for about 2 min. 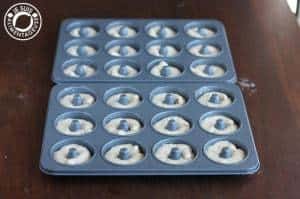 Mix vanilla, agave nectar, flax seed mixture, milk, and margarine until combined. Add flour, baking powder, and salt. Mix until incorporated, but do not over mix. Bake for 12-14 minutes at 350F until golden. 12 minutes if using a mini-donut pan, 14 if using a regular-sized donut pan. Remove from oven, let sit in the pan for about 1 min, then remove from pan and let cool on a wire rack until cooled. For the glaze, in a small pot over medium heat, cook the blueberries and lemon juice until the blueberry skins pop and the juices come out. Use a spoon to smash the berries if necessary. 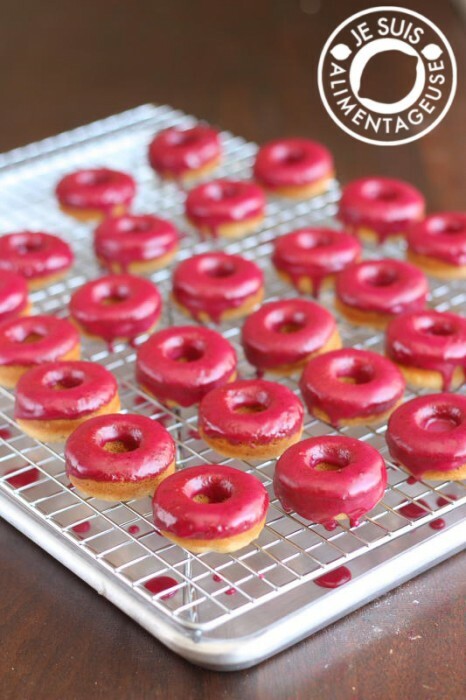 Dip cooled donuts in glaze, let excess drip off, then let them dry on the wire rack. Leave for about 10-15 minutes until dry, then eat! Thanks Lisa! Sounds and looks super-yummy! Want to see lots more yummy food from me and my friends, and cute pictures of my kid? 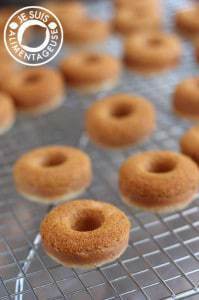 I’m a new vegan, thank u so much for these donuts they are so delicious and easy, they have a wonderful cake donut texture, I love cake donuts, but after becoming a vegan I thought i wouldn’t be able to enjoy cake donuts anymore 🙁 but thanks to u I can 🙂 They puff up nice and high in the oven look just like donuts , What I loved about these is that u can make them any flavor u like , these are the best bakedvdonuts i’ve tasted! I’m impressed! thanks a million! Oh great, so glad you are enjoying them! I’m a new vegan, thank u so much for these donuts they are so delicious and easy, they have a wonderful cake donut texture, I love cake donuts, but after becoming a vegan I thought i wouldn’t be able to enjoy cake donuts anymore 🙁 but thanks to u I can 🙂 They puff up nice and high in the oven look just like donuts I’m impressed! thanks a million! I love the color on these! I know! Isn’t it gorgeous?! Looks so deeeelicious! So cute too. They look easy enough to make. Might just have a go some time soon. Thanks.I had featured u in the post of 7 New Ways To Make Fresh Mini Donuts At Home on AllFreshRecipes, looking forward to ur more recipes! Dying over that blueberry lemon glaze! 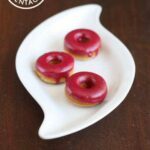 Blueberry donuts are my favorite, but this glaze sounds out of this world AWESOME on those perfectly plush vanilla donuts. Want!